Bearing more than a passing resemblance to the cheaper Canon iP3600, the Pixma iP4600 printer is exactly the same size and weight. It looks identical in almost every respect, although it also comes with an extra media tray for direct printing onto compatible CDs and DVDs. More similarities include the fact that it runs exactly the same cartridges as you'll find in both the iP3600 and MP620 printers, with precisely the same running costs. 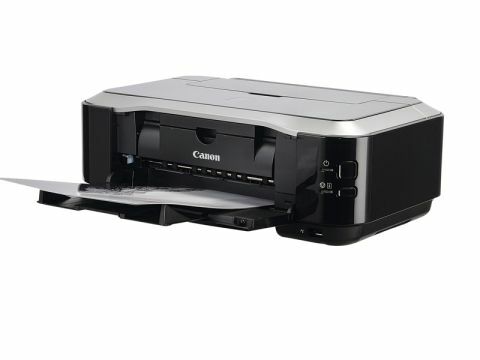 In common with the other Canon A4 printers, the iP4600 features a handy bottom input tray that slots under the printer, as well as a rear-mounted, vertical tray into which you can conveniently drop photo paper. The advantages are that you don't have to empty out existing paper every time you want to switch between plain and photo paper. The latter can also be inserted face-up, so it's less prone to picking up dust and doesn't have to undergo a tight curl as it passes through the transport system. The main difference between the iP4600 and the other two new-generation iP3600 and MP620 Canon printers is speed. Photo quality is stunningly good in all cases, with beautiful skin tones, voraciously vivid colour when required, and excellent tonal separation –but the iP4600 does it in about half the time.